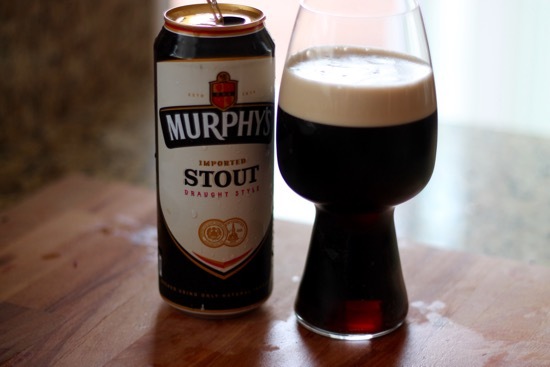 Here we are FINALLY with 2 cabbage recipes from our Head Games Episode, one is all the way back from St. Patrick’s day. We had a little fun with the cabbage part of our meal this year. You see, I have a go to cabbage recipe that’s to die for from my Mom. It always gets hoots and hollers from the feasting crowd. Naturally, we had a cabbage-off. Both were good, but the winner was, (insert drumroll sound here) my Mom’s. Sorry Alton, if I never had my Mom’s, it would’ve been good. But, any recipe that starts in bacon fat wins. 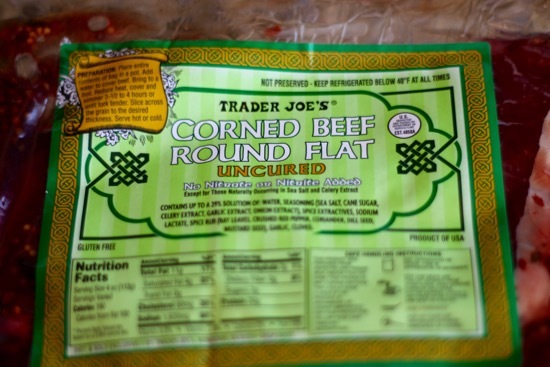 Here’s how I made our Corned Beef and Cabbage (off) feast! 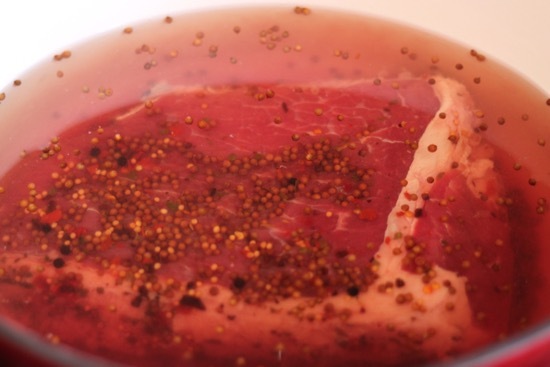 Grab your corned beef. Mine was 2 1/2 lbs. Place it in a Dutch oven or large stock pot. Cover with water, bring to a boil, reduce heat and simmer for 3 1/2-4 hours. That’s it! About an hour and a half before your corned beef will be done, start the cabbage. My Mom’s cabbage starts with bacon. I halved the recipe since I was making 2 different kinds. 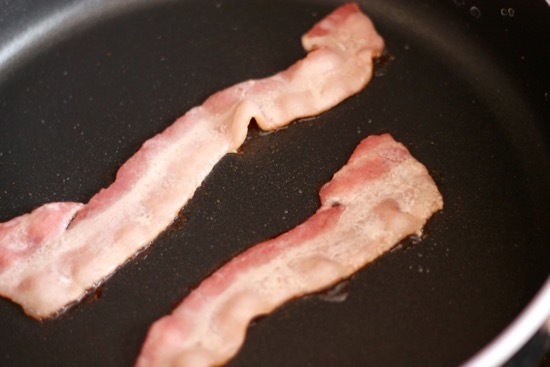 Throw the bacon in the pot. Forget that you were supposed to cut it in to small pieces, pull it back out, cut in to small pieces and throw back in the pot. Don’t worry, no one was looking. 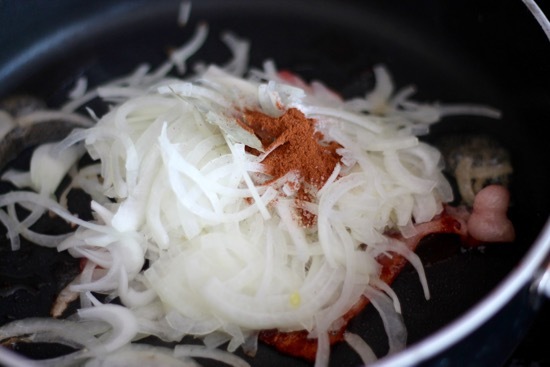 Add in thinly sliced onions, cinnamon and salt. Cover and cook until onions have softened, about 7 minutes. Next, add in a head of shredded cabbage. Cook for another 7 minutes until the cabbage starts to wilt. Now you’re ready to add in the chicken broth, red wine vinegar, apples, sugar and pepper. 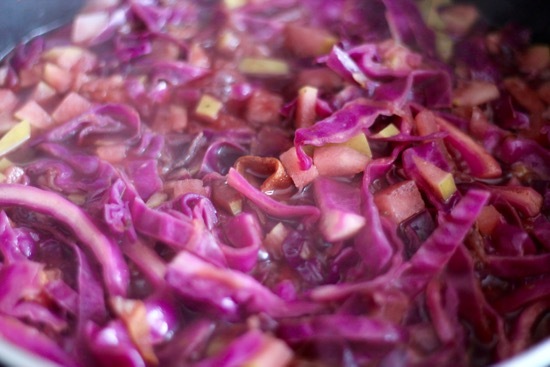 Bring to a boil, reduce heat and simmer for about an hour, until most of the liquid has absorbed and cabbage is tender. If you’re doing a cabbage-off like me, start your next batch. Alton’s starts off with heating canola oil over medium-high heat in a large pot. Add in the apples and cook until slightly browned, about 5 minutes. Next add in apple juice, caraway seeds, salt, pepper and cabbage. Bring to a boil, reduce heat, cover and let simmer for about 20 minutes. 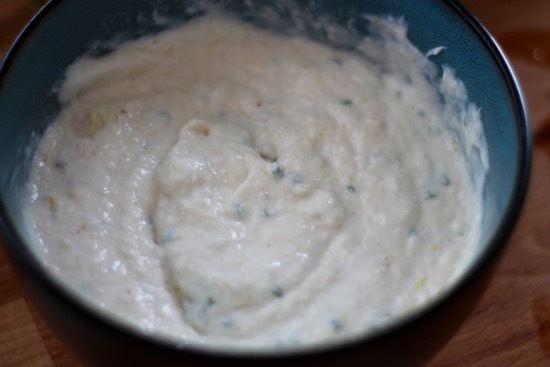 Next, I whipped up a quick horseradish cream sauce. Just put sour cream, prepared horseradish, chives and chopped up dill pickles into a bowl and mix together. Easy Peasy! 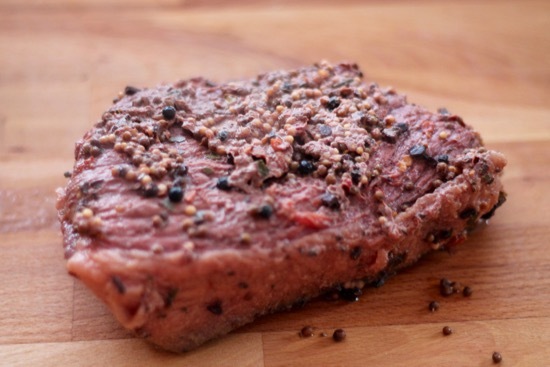 Take out your glorious roast and slice it up. 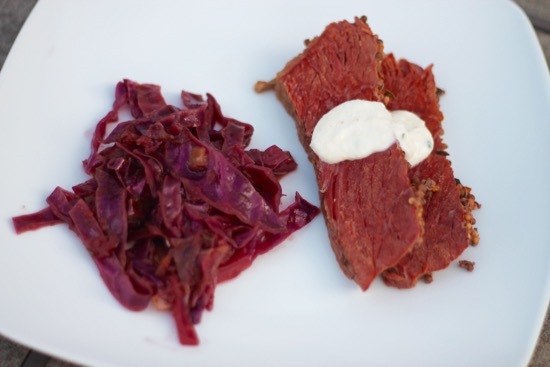 Plate up a couple of slices with some cabbage and a dollop of horseradish cream. You could also get a couple of pieces of rye bread, smear with Thousand Island dressing and make a sandwich with the corned beef as well. Yum! 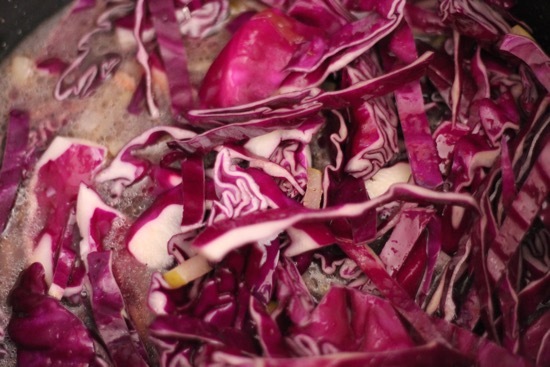 Check out all the other recipes you see here over at Sarah ‘n Spice, but check out Alton’s braised cabbage recipe below. Heat canola oil over medium-high heat in a large pot. Add in the apples and cook until slightly browned, about 5 minutes. 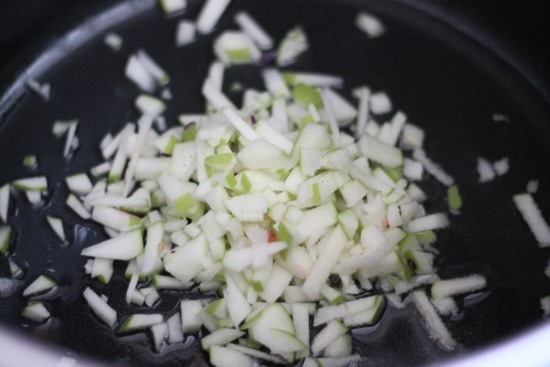 Turn heat to high and add in apple juice, caraway seeds, salt, pepper and cabbage. Bring to a boil, reduce heat, cover and let simmer for about 20 minutes. 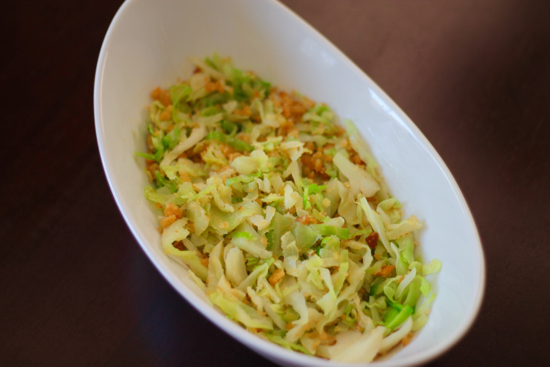 Next up we have a delicious cabbage slide with the most amazing crouton dressing! I’ve finally gotten around to finishing the Head Games episode from Good Eats. It’s all about cabbage. This recipe wasn’t bad. It’ wasn’t my favorite, but I loved the idea of the crouton dressing. I have some ideas for this in the future! 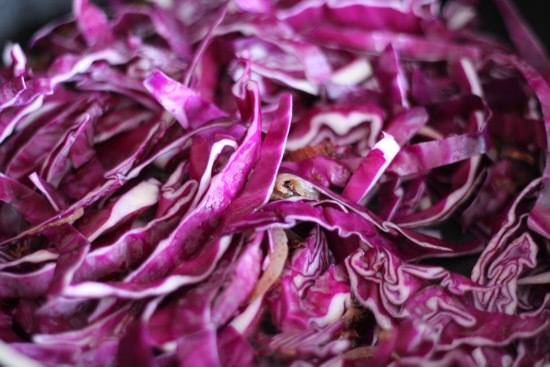 If you love cabbage, definitely give this one a try. Add in the mustard and stir together. I didn’t have the caraway seeds the recipe calls for, so I just stuck with the mustard. 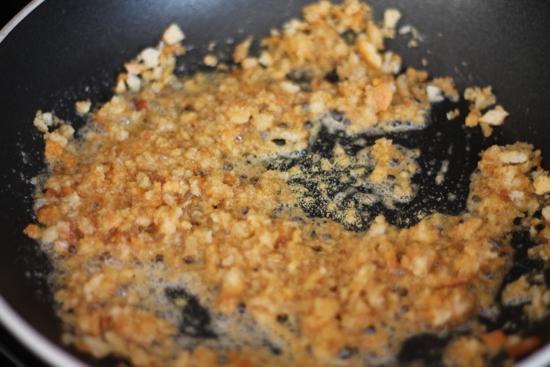 Continue cooking until the butter starts to brown and smells nutty. 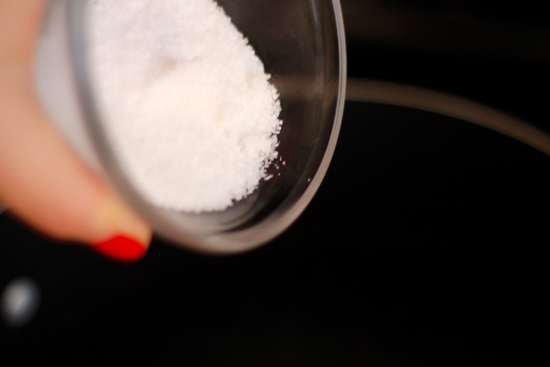 In a large pot of boiling water, add in sugar and salt. Stir around until it’s dissolved. 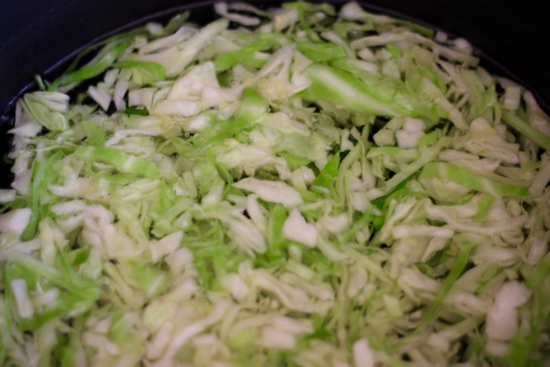 Add the shredded cabbage right into the boiling water and cook for EXACTLY 2 minutes. Why? Alton Brown’s got this down to a science. Don’t ask questions, just do. Add the cabbage to a serving bowl. Top with the butter croutons and toss together. Enjoy right away while it’s still warm. Fill a large pot with water and bring to a boil on high heat. 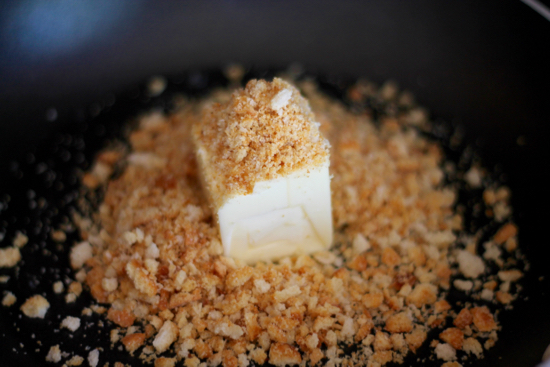 Melt the butter and crushed croutons in a skillet over medium heat. 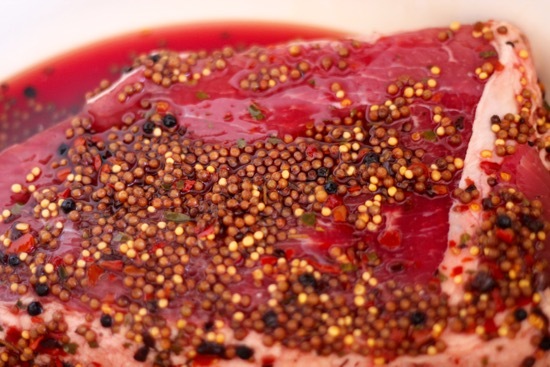 Add in the mustard and caraway seeds, stir together. Continue cooking until the butter starts to brown and smells nutty. Remove from the heat, and set aside. Add in sugar and salt to boiling water. Stir around until it’s dissolved. Place the cabbage in the boiling water and cook for 2 minutes exactly. 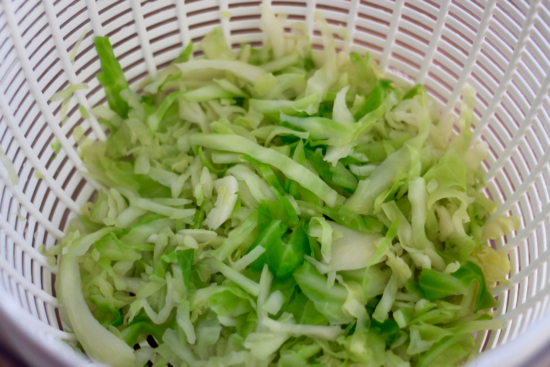 Scoop the cabbage into a salad spinner and spin to remove excess water. 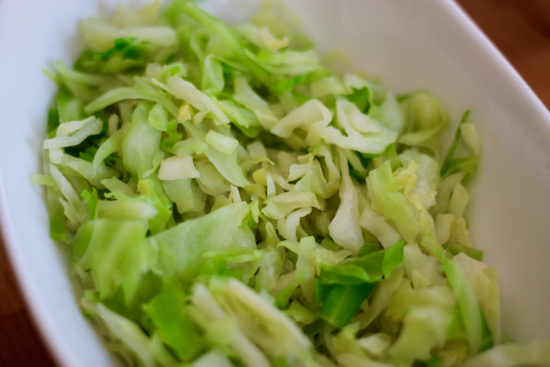 Place cabbage into a serving bowl. 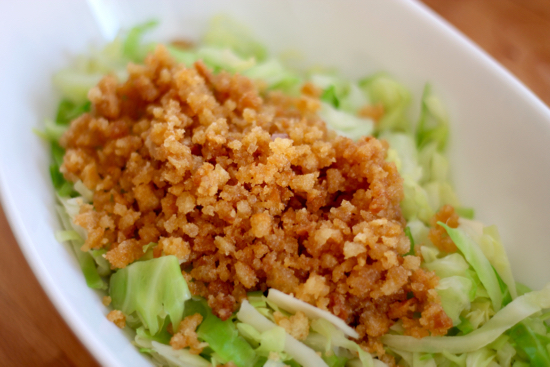 Add the cabbage to the butter-crumb dressing and toss to coat thoroughly.